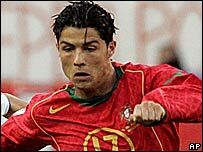 Portugal coach Luiz Felipe Scolari has paid tribute to Cristiano Ronaldo for playing in a World Cup qualifier just a day after the death of his father. The Manchester United winger helped secure a 0-0 draw in Moscow to leave Portugal one win away from the finals. "Cristiano had the support of the whole team in this important moment of his life," said Scolari. Ronaldo was given time off from United's pre-season tour to be with his father, who had been ill for some time. Portugal now need to win either of their final two home games to finish top of Group Three. They host Liechtenstein in Aveiro on 8 October and Latvia in Porto four days later.